In Hans Winkler’s Nova Library the artist worked with organizations in Vancouver’s Downtown Eastside to construct a library of books of “junkie literature ” inside the main branch of the city’s central library. 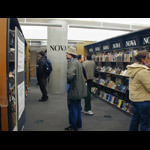 Inspired by William S. Burroughs' novel Nova Express, the library forms a social sculpture where a physical and literary space is created both for and by a community, challenging assumptions about literature, drug culture, knowledge, and the public sphere. Hans Winkler, whose work has shown internationally since 1982, is based in Berlin. Exhibitions, actions and public art projects include p.t.t.red (paint the town red, 1988–2000); treffpunkt niemandsland, Brennerpass, exhibition and the Hermitage Library, 1997; Pierogi Gallery New York, 2001; Künstler/Archiv, Akademie der Künste, Berlin, 2005; Focus: Istanbul, Martin Gropius Bau Berlin, 2005; Nova Library, grunt gallery, 2005, Live Biennale of Performance Art, Vancouver; Last Exit 44, intervention, Berlin 2007; and Ezra Pound´s Cage, Nuova Icona, Venice. In 2002 he was co-curator of the fest kunst exhibition together with Marion Piffer-Damiani in Brixen, Italy, and in 2004 co-curator of legal/illegal, together with Helen Adkins and Kai Bauer, NGBK, Berlin. Winkler has been Visiting Artist/Professor at San Francisco Art Institute (SFAI) since 1999.